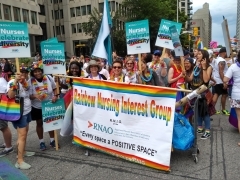 Celebrating the history, courage and diversity in the province, members of RNAO’s Rainbow Nurses Interest Group, alongside other nurses and nursing students, took to the streets in June for the annual Pride Toronto festival. For the 11th year in a row, RNAO members joined thousands of marchers on June 25 to show their support for LGBTQ communities. Ontario’s nurses were honoured to be part of the historic event and continue their long-standing tradition of encouraging healthy communities through equity and respect. RNAO members are also taking part in Pride events across the province being held throughout the summer. See the full list online.